Snapchef is honored to work with Mansion and be part of the Rhode Island Healthcare Association. Here is a little more about Mansion. 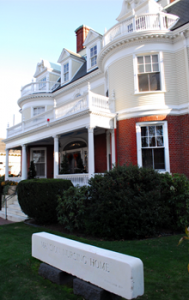 The Mansion Nursing and Rehabilitation Center is dedicated to restoring each resident to their maximum function. Their health care services are based on evidence-based practices, managed by an experienced healthcare team. Mansion provides short-term rehabilitation services after hospitalization and long term stays for those who have chronic or recurring health issues. Respite services are also offered for temporary assistance. Mealtimes at the Mansion are special because of their lively food culture. They work hard to ensure the residents enjoy their meals. Mansion ensures food is an extension of caregiving. Everyone has their favorite dishes, favorite recipes. Residents look forward to selections which they pick from a choice menu. Chef-inspired recipes offer a wide variety of meals sure to satisfy. The food options are seasonal and topical; many of the dishes are developed from well-known cooking shows, and specialty menu websites. Staff and administrators enjoy the same food their residents eat, and they have a long tradition of offering food to our guests and family members. The Mansion has a successful team in their kitchen. The Food Service Director, in addition to strong culinary expertise, has many years of experience with the special regulatory requirements and challenges of dietary administration in a long-term care setting. She leads a capable long tenured staff, who possess an array of food safety certifications and qualifications. Under her direction, the Dietary Department has welcomed many years of excellent inspections and rave resident reviews. Mansion keeps their meal service interesting. Meals are served in one of two dining rooms with table service and pleasant music in the background. Meal offerings including lunch and breakfast buffets, meals in the garden in the warm months, and special foods for special occasions and holidays. 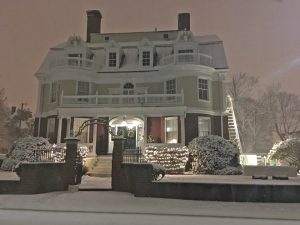 From Chinese New Year to Cinco de Mayo or Super-Bowl parties and watching baseball events with chip and dips, the Mansion will have meals for all occasions. Other special events include the annual May Breakfast, a Family and Friends picnic, Harvest Breakfast, and special Thanksgiving and major holiday meals with guests. Mansion knows that creating a tasty, fun, festive, community environment goes a long way in making an inviting and socially comforting environment for their residents and the entire Mansion family.